Held monthly, beginning at Personal & Professional Development (Bldg. 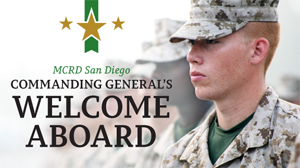 14), the Depot Welcome Aboard is an important mandatory attendance event for all newly reporting MCRD military personnel. Family members are welcome and strongly encouraged to attend. Presentations provide informative overviews of the various personal services programs, recreational opportunities, and the other support programs available aboard the Depot – as well as in the greater San Diego military and civilian community. Regular participants are; Education & Career Services, Military Family Housing Office, TMO, New Parent Support Program, Personal Financial Management, Family Advocacy, Chaplain, Marine Corps Family Team Building/L.I.N.K.S., Depot Library, Navy-Marine Corps Relief Society, the USO, the Armed Services YMCA, Tickets & Tours, and Marine Corps Exchange …to name a few. Once you have orders to MCRD San Diego in hand, pay a visit to your Transportation Management Office (TMO) as soon as possible. Peak moving seasons, school rotations, or other specialty unit moves may affect your ability to schedule the dates you want. It helps to be as flexible as possible and have several alternate packing and shipping dates available. If the service member is unavailable, the spouse can arrange for the move, provided he or she has power of attorney. Your Legal Assistance office can work up the required documentation, if necessary. The government will move your household goods (HHG) from one duty station to another. There is not a lot you need to do the day of the move. However, a HHG move is more involved than just changing your address. Government moves go smoother if you prepare properly before the packers arrive. Your local TMO counselor can give you a “to do list” to help you get ready for the movers. A clean, un-cluttered environment will make packing more organized and unpacking easier at the next house. Find out from TMO your entitlements and how much weight you’re allowed to move or store and instructions on how to estimate your weight. You will have to pay any excess weight charges. Garage sales and charity donations are good ways to reduce your weight before moving day. There are some items the government won’t move. Your TMO counselor will provide you with a detailed list of what those are. You’ll need to make other arrangements to move those items or dispose of them. You wake up by 0600 on the morning your packers are to arrive, have breakfast, and watch as the packers arrive with boxes, paper, quilts, and tape. Rolls and rolls of tape will be used. Those special items you need crated or wrapped will be done by folks who have the proper packaging material and who have done it at least one time more than you have. When the packing is complete, the truck is loaded and someone else drives your belongings, not you. There are typically more packers than you have eyes. It is hard to really keep watch over how and where your things are packed. Once the truck leaves, you hold your breath that your entire shipment will arrive in one piece. If you need to file a damage claim, be prepared for a lengthy and frustrating process. Resist the desire to ditch the reimbursement process and just use packing tape to repair your china cabinet. Don’t throw the tape away though; you will not receive replacement value for your damaged property, but a depreciated value. There may be times when you want Uncle Sam to move you, with the exception of certain items. This might include items you want to ensure will get there undamaged, such as family heirlooms, pictures, and unique or irreplaceable items. The combined weight of your partial move and the government move cannot exceed your weight allowance. The Do It Yourself (DITY) or Personally Procured Move (PPM) is when you move yourself from one duty station to another and the government reimburses you for 95 percent of what it would have cost them to move you. Many families choose to do a DITY move, hoping to come out ahead financially. Your TMO office must approve the DITY move. Any cost incurred by you above what the government allows is not reimbursable. Before deciding to do a DITY, consider the size of your household and whether it’s really worth it to you. A family with small children may want to forego the possible financial gain of a DITY for the ease of an HHG move by Uncle Sam, especially if the service member will be deploying, will have little time upon arrival at the new duty station, or is not available at all during the move. On the other hand, a family with older children may want to work together, move themselves, and make a family purchase with the leftover money. Scheduling a move during peak turnover time can be difficult. A DITY move avoids the hair-pulling frustration of readjusting your schedule to meet the availability of the movers. You don’t have to wait or watch the packers wrapping your wedding china. If you estimate your weight as close as possible, pack well, and travel frugally, you can come out ahead financially. Your property is in your control from start to finish. You know where and how everything is packed. Everything arrives with you, so there’s no waiting for your stuff while you sleep on the floor or in costly hotels. You pack, you load, and you drive. Then you unload and unpack, and if anything is broken, it’s your fault. Any cost over what the government allows will not be reimbursed. Failure to weigh properly and file the proper documents could also cost you money. A limited selection of items are available for check-out, and are intended to assist those just arriving for duty in San Diego, or those preparing to depart on their next PCS. Items include dish-packs, toasters, coffee-makers, blenders, mixers, food processors, additional kitchen accessories; pots, pans, plates, silverware. Also available are a limited number of car-seats, light-weight strollers, and light-duty playpens. In addition the lending locker has irons and ironing boards available for two-week check-out. 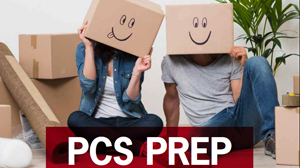 The PCS-Prep Brief, conducted at Personal & Professional Development (Bldg. 14) – is an excellent opportunity to preview or review your preparations for a transfer. Representatives from the Distribution Management Office and Integrated Personnel Administration Center (IPAC) will be available to answer questions regarding the “mechanics” of the move and pass on information pertaining to pay and benefits associated with your particular situation. 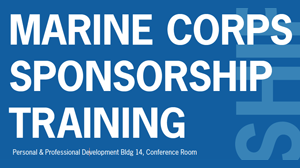 In accordance with Marine Corps and Depot Order, the RAP office offers a Sponsor Orientation brief. 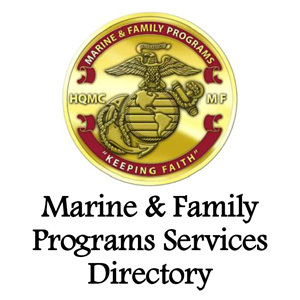 Intended for those who have been assigned sponsorship of Marines bound for duty at MCRD – the brief provides timely tips and settling-in information along with community contacts and references that a sponsor is most often asked for by newly-arriving Marines and their families. Sponsor orientation/training is conducted on an individual basis at the Relocation Assistance Program office as needed. If you are assigned sponsorship duties, please contact the RAP office to schedule your orientation. Approximately one half-hour of time will be required for the training, the completion of which will be recorded and a certificate issued.